Although COPD cannot be cured, it can be effectively treated. Doctors can help people with COPD feel better, live active lives, and slow the damage to their lungs. The earlier COPD is detected, the better the results of treatment. Take this simple questionnaire to find out if you might have Chronic Obstructive Pulmonary Disease (COPD). 1. Do you cough several times most days? 2. Do you bring up phlegm or mucus most days? 3. Do you get out of breath more easily than others your age? 4. Are you older than 40 years? 5. Are you a current smoker or an ex-smoker? If you answered yes to three or more of these questions, ask your doctor if you might have COPD. available to help people feel better and enjoy more active lives - at all stages of the disease. "Is it possible your COPD could be better controlled?" To download a copy of the "Breath Assess Tool", just click on the image. 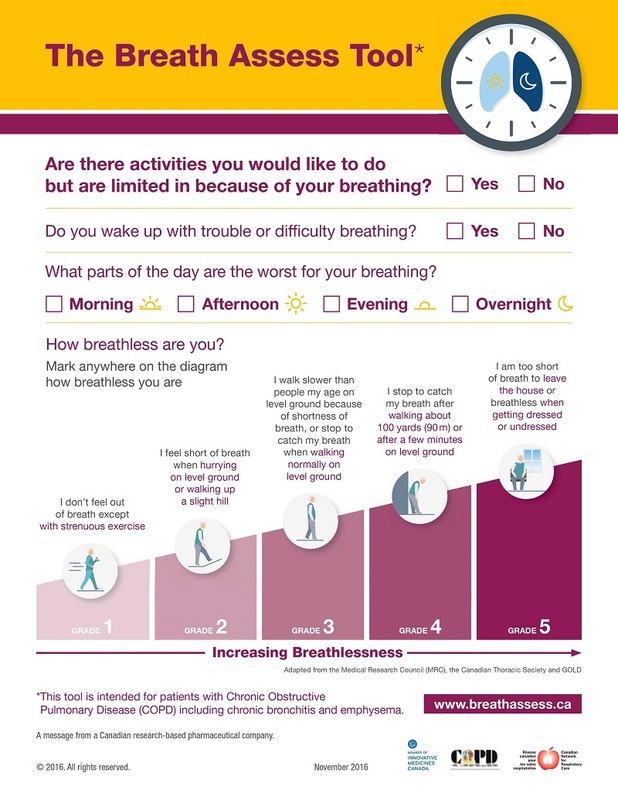 You can then print the sheet out and take it to your doctor to discuss Chronic Obstructive Pulmonary Disease.